In this new feeding series, I’ll be discussing the diets and feeding options of animals typically found on the farm. I’ll give you the various feed options and let you decide what works best for you, your animals and your farm. This week we’re discussing horses, an animal very near and dear to my heart. Feeding horses doesn’t have to be difficult or even very expensive, yet I’ve found that a lack of education leads to a lot of problems for the horses and their owners. Horses more than any other animal need a diet tailored to their needs. Of my seven horses, each of them receive a slightly different mix of feeds and supplements. Determining your individual horse’s needs usually involves a lot of trial and error. Ways you can determine your horse’s optimal health are their performance, behavior, weight and coat/hair. The Henneke System Body Condition Scoring is most often used to determine if a horse is at its optimal weight. Other factors that can effect a horse’s weight are parasites, illness and teeth. Horses should be dewormed against parasites every 6-8 weeks. A deworming rotation program will ensure all parasites are being routinely removed from the horse’s system. Horses should receive an annual exam from their vet along with a check of the teeth by a vet or equine dentist. If your horse suddenly drops weight, has trouble losing or gaining weight, or is acting sluggish, your vet can perform tests to determine the cause. Any changes in feed should be introduced gradually over the course of 1 – 4 weeks. Introducing a change in feed or hay too quickly can lead to colic or founder and very expensive vet bills or death. Consult your vet if you have any questions about your individual horse’s nutrition. Horses are non-ruminant herbivores. They do not have a four-chamber ruminant stomach like cows. They actually have a very small stomach that can only hold 2 – 4 gallons for the average 1000 lb horse. (One chamber of a cow’s stomach, the rumen, can hold up to 25 gallons) For this reason, it is better for a horse to eat 2 – 3 small meals per day. Horses are also grazers who typically eat for 16 hours a day, keeping something always moving through their digestive system at all times. This reduces the amount of gas that can build up in the system and cause colic. Horses’ stomachs are more sensitive to poisons and molds than ruminant herbivores. Owners should regularly walk their paddocks to make sure they are free of poisonous plants. Owners should also make sure hay and grain is free of mold or poisonous plants. Hay should be purchased from reputable growers and stored in watertight facilities. Unsafe hay can lead to diseases such as colic, botulism poisoning or Equine protozoal myeloencephalitis (EPM). Horses do not have a gall bladder, so they cannot digest a large amount of fat. Most horse feeds only contain 3 – 4% fat. Horses can digest up to 20% fat, but it can take them up to 3 – 4 weeks to adjust to the change. Horses’ diets (and humans’ for that matter) consist of six different nutrients: water, carbohydrates, fats, proteins, vitamins and minerals. Carbohydrates are the most readily available source of energy. Energy is then taken from fat. Protein is the least readily available source of energy. Water, vitamins and minerals are not energy sources, but help the body to metabolize energy and make it more readily available in the horse’s body. Owners whose horses are showing decreased energy should look to increase their carbohydrate consumption first. Water is the most important nutrient in a horse’s diet. Dehydration can lead to colic and death. Clean, fresh water should be available at all times. Horses typically consume 5 – 15 gallons of water per day. Water consumption can vary based upon work load, heat and humidity. Just like humans, horses can commonly become dehydrated when the weather suddenly turns cold and they do not think to drink because they are not hot or sweating. Salt and minerals can be added to a horse’s feed to encourage water consumption. Carbohydrates make up the largest portion of a horse’s diet. Carbohydrates are broken down into structural (fiber) and non-structural (starch & sugar) carbohydrates. Examples of structural carbohydrates are hay, grass and beet pulp. Non-structural carbohydrates are grains such as corn, oats and barley. Non-structural carbohydrates contain a more concentrated form of energy than structural carbohydrates. Overfeeding of non-structural carbohydrates can cause a horse to become “hot” and hyperactive. Too much grain can also cause laminitis and founder. They should be fed based upon a horse’s individual energy needs. The bulk of a horse’s diet should consist of structural carbohydrates, with grain added to help with weight gain and energy levels. Fats are the most concentrated form of energy. It takes 9 Kcal/kg to burn fat, while it only takes 4 Kcal/kg to burn carbohydrates or protein. It has become common practice to add fat to feed in the form of oil. While this has proven effective in increasing the weight and energy of a horse, it is important that the horse’s needs are being met with carbohydrates first, since horses cannot digest excessive levels of fat. Senior horses have an even lower tolerance for fat and should instead be fed a higher quality carbohydrate/protein such as soaked alfalfa. Protein is necessary for cell growth and regeneration. Young horses need protein to ensure healthy growth. Working horses need protein to assist in muscle growth and maintenance. Older horses, who cannot digest protein as easily, need high quality protein to ensure weight and muscle maintenance. Protein is present in grains and forage. Owners should look at a horse’s total protein intake from grain and forage to determine a balanced diet. Protein can be a key part of weight gain for an underweight horse. Most weight gain supplements are actually high protein and low fat. Likewise, an overweight horse may need less protein. Consider feeding less grain or a lower protein grain. If they are on a high protein hay like alfalfa or peanut, consider changing them to a blended hay like timothy/alfalfa or a grass hay like straight timothy or orchard. Vitamins are organic materials either produced in the body or consumed through feed and are necessary for the body to function properly. Vitamins are broken down into fat-soluble (A, D, E, and K) and water-soluble (C and B-complex). Fat-soluble vitamins are only absorbed into the body through fat, which is why some fat is necessary in the diet. These vitamins are also stored in a horse’s body fat. Over supplementation of these vitamins can lead to toxicity. Water-soluble vitamins are absorbed into the body through water, which is one reason why water consumption is so important. Over supplementation of these vitamins leads to vitamins being flushed out of the body through urine, which is a waste of money. Minerals are inorganic materials that are not produced in the body. They are necessary for many body functions and must be consumed through diet or supplementation. Mineral balances are important in horses as imbalances can cause a variety of problems. One important mineral ratio is calcium to phosphorus, which should be between 1:1 to 2:1. An imbalance can cause calcium to be pulled from the bones, which leads to a lack of bone and hoof density. Feeding too much bran, grain or certain types of hay can cause an imbalance. Hay and pasture grasses can be tested for nutrient levels through your local extension office. Many feed companies produce mineral supplements designed to offset common mineral deficiencies found in regional grasses and hays. Talk to your local feed store about which mineral supplements are best for your horse. Horses can lose minerals and electrolytes when they sweat during the summer or heavy workouts. These can be replenished by feeding mineral and electrolyte supplements. However, it is important to avoid giving electrolyte supplements to a horse that is already dehydrated, as it can worsen their condition. Severe dehydration cases should be consulted with the veterinarian. Mild cases can be treated with soaked beet pulp or alfalfa cubes and Kosher salt. The beet pulp or alfalfa cubes will encourage increased water intake while the salt will also encourage them to drink more water. The best way to ensure a horse is getting the proper nutrient levels is through a blood test. Most manufactured feeds have been balanced to deliver the proper nutrients; however, they must be fed at the levels recommended on the bag to ensure the horse is getting the proper amounts. We’ll go more into the different types of feed below. Now, let’s look at the types of feed and hay. Forages are classified as legumes or grasses. The nutrient levels of forages can vary greatly depending upon soil quality, management and time of year. Legumes have higher levels of protein, calcium and sugar than grass. Legumes include alfalfa, clover and peanut. They are typically leafier than grass and appear more green when dried. They are also typically more expensive. Grasses include timothy, orchard, coastal and tifton. Hay is forage that has been cut, dried and baled before being fed to horses. It is typically available in square or round bales, but may also be available in bags as chopped, cubed or pelleted hay. When purchasing hay, it is important to ensure it has been stored indoors. Buy hay that was cut within the same year to ensure optimal nutrient content. Hay should smell fresh. It should not be dusty or have a musty smell. Hay that is warm to the touch contains moisture and mold. You should also avoid hay with too many weeds because it may contain poisonous plants and will likely have little nutritional value. Horses should eat 1.5 – 2.5% of their body weight in forage per day. That means 15 – 20 lbs of hay per day for a 1000 lb horse. If you live in an area with sandy soil, the University of Florida has actually found that feeding large amounts of hay is the best prevention for sand colic. When purchasing hay, try to buy the best hay your budget can afford. The farther north a hay is produced (with the exception of the tundra), the richer the soil and the higher the calorie and nutrient content of the hay. However, this can also mean the more expensive the hay as well. If you live in a northern state, you probably feed alfalfa or some alfalfa blend. Southern states may feed peanut, coastal or tifton, or pay more to purchase hay that has been shipped down from up north. The poorer the hay, the more of it you’ll have to feed. You’ll also have to feed more grain. Calculate your costs to see what will be the most beneficial for your horse and your budget. I’ll give a breakdown of what I feed one of my horses at the end. Beet pulp can be fed as a forage substitute. It is easily digestible and can be free of sugar, unless molasses has been added back in. It can also be more balanced than hay, having a more equal calcium to phosphorus ratio. Since it is low in starch and sugar, it may be the most beneficial for insulin resistant horses. Some beet pulp has had molasses added back in, so use caution if you have an IR horse. You can look for beet pulp without molasses or soak and rinse the beet pulp prior to feeding. It is also a great supplement for underweight and hard to keep horses. Soaked beet pulp can also be a great option in horses with dental problems or those who need to increase water intake. However, it lacks many nutrients that hay has, so additional supplementation may be necessary. It is advised that no more than 25% of your horse’s total diet be beet pulp. Rice bran is another product that can be considered a forage substitute. It is high in fat, easily digestible and an excellent source of vitamin E. However, it is loaded with phosphorus, upsetting the delicate calcium:phosphorus ratio. It’s recommended that you avoid feeding raw rice bran and instead feed a rice bran based supplement that has additional calcium added back in. Corn has historically been a popular feed for horses. It is an excellent source of energy, is readily available, and inexpensive. However, it does need to be fed with caution. Corn in its kernel form is not easily digested by horses. Corn must be cracked or ground for a horse to properly digest it. Corn contains 71% starch, 8% protein, 4% fat and only 2% fiber. Most of the starch cannot be digested in the foregut and moves onto the hindgut where it ferments. This can be problematic for laminitic horses. Too much can also cause founder. It has a reputation for being a “hot” feed; however, this is often because it is easily overfed. Corn is a heavy grain and should be fed by weight, not volume. Oats continue to be a popular grain choice for horses. It is easily palatable and can be fed whole. It is a very balanced grain with about 53% starch, 12% protein, 5% fat and 12% fiber. Also, most of the starch is digested in the foregut, making it a very safe feed. Some horses may still get a sugar high from oats, so you’ll have to try it and see. Many concentrated feeds recommend whole oats as a supplement to their feed based upon the horse’s individual metabolism. Barley is occasionally referred to as a horse feed, but it is not recommended. It has a hard kernel that is not easily digested by horses. Even rolled, most of the starch cannot be digested in the foregut, leaving it to ferment in the hindgut. Bottom line, don’t feed barley. 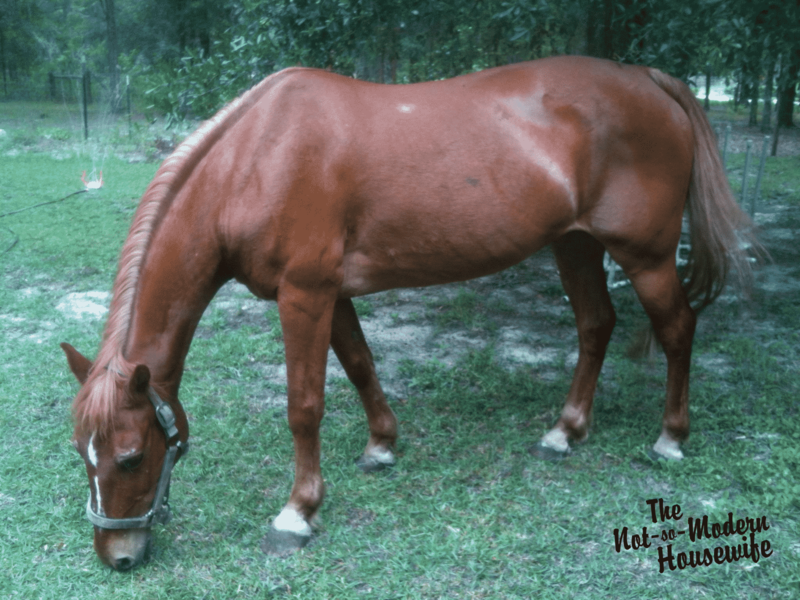 Sweet feed is a common choice for many horse owners. It usually contains molasses, oats, corn and a pellet containing vitamins and minerals. Horses like the molasses and it makes it easy for owners to hide medications and supplements. However, the added sugar can cause problems in horses with diseases such insulin resistance, cushings and laminitis. It can also give some horses a “sugar high,” effecting their performance. These feeds have very little nutritional value for the price and usually result in owners having to feed more of it to maintain the horse’s weight. It can make a good supplement to more complete feeds to make them more palatable or to get horses to eat supplements or medications. These feeds typically come in a pelleted form and are balanced to provide the proper amounts of protein, fat, fiber, vitamins and minerals. Complete feeds also contain a portion of a horse’s daily forage ration, usually through beet pulp. It is important to consult the feed bag when determining how much grain to feed your horse. As an example, Seminole Gold Chance 12+ recommends .25 – 1 lb of feed per day for every 100 lbs of body weight for mature maintenance horses. That means 4 – 10 lbs of pellets per day for the average 1000 lb horse. It is still recommended the horse eat 1.5 – 2% of their body weight in hay per day. This amount is divided based upon the number of feedings per day. Feeding less than the recommended amount can result in the horse not receiving their daily requirements of important vitamins and minerals. Unfortunately, the recommended daily amount can result in obesity in some horses. Concentrated feeds do not contain any additional forage, but deliver the recommended daily amounts of vitamins and minerals in a smaller grain feeding. The pellet is meant to be fed in addition to a diet high in forage. It can be fed alone as the primary pellet or as a supplement to a grain diet. The ration is based upon age, weight class and work level of the horse. As an example, Seminole Equalizer recommends mature maintenance horses weighting 800 – 1200 lbs be fed 1 lb of pellets per day. They may also be fed 0 – 6 lbs of whole oats or 0 – 2 lbs of beet pulp depending on the individual horse’s needs. These feeds are great for “easy keepers” and other horses who would otherwise get fat on complete feeds. It also offers a more customizable option if you feed multiple horses with varying needs. A horse’s diet is made up of a balance of forage and grain or pellets. What works best for you will be based upon your budget and your horse’s individual needs. The healthiest and most economical diet is made up mostly of forage. Grain should then be chosen and fed based upon the horse’s age, size, activity level and metabolism. Consult your veterinarian if you have trouble getting your horse to their optimal weight. Most feed manufacturers also have equine nutritionists on staff to answer your questions. Try to meet your horse’s nutritional needs with forage first and then feed before adding supplements. Over supplementation can cause health issues and cost you money. If you suspect health issues, consult your veterinarian to get a proper diagnosis and treatment plan. My horses have 24/7 access to a Tifton hay roll. Five standard sized and two miniature horses go through one roll a week. I credit this as the primary reason my horses are fat and shiny. Three of my horses are over 20. They eat Seminole Wellness Senior. Two of them also get soaked alfalfa cubes. Senior horses have slightly different nutritional needs, but that doesn’t mean they should be underweight. If you have any trouble keeping weight on your senior horse, make an appointment with your vet to go over your feeding plan and rule out any health issues. Senior horses start to lose their teeth and need their feed and forage soaked. Let me know if you have any questions as well. I’ve fed a variety of horses with varying needs. I’m happy to help as much as possible. I didn’t know horses should eat 3 meals a day. That’s just like humans. I guess both species have small stomachs.